In Bhalla's mayoral campaign last year, his ELEC campaign report shows he loaned himself $31,000. Hoboken residents can attend the event for $150. 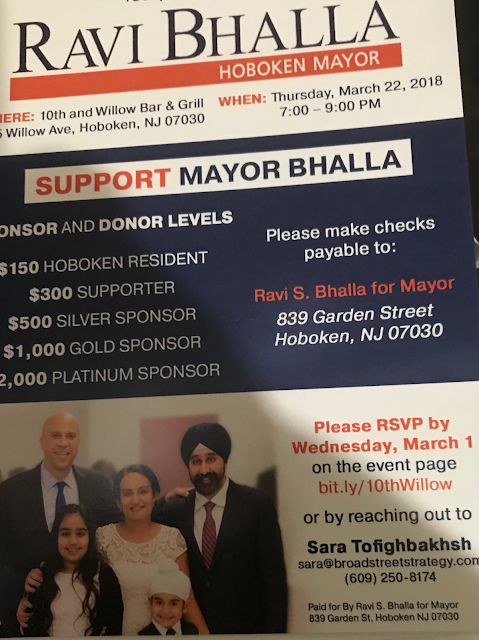 On the political front, Mayor Bhalla continues to oppose the City Council overturning a veto giving Hoboken voters a referendum where they choose to bring back runoff elections. Runoff elections were eliminated in a similar referendum back in 2012. Sources say the Bhalla administration, City Council members and close observers agree the council will overturn the veto and then Hoboken voters will decide in November. There may be further adjustment with interests among many to see this converted to an instant runoff option. The City Council have twice voted overwhelmingly to approve the referendum letting Hoboken voters decide.